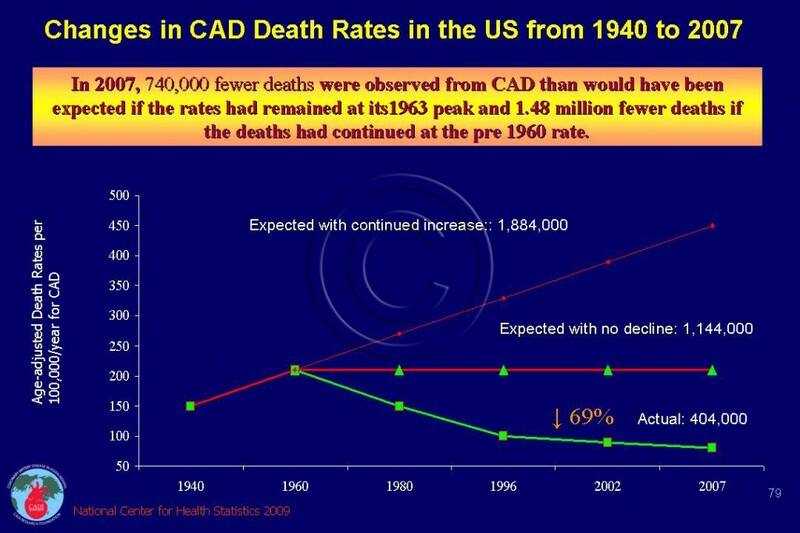 Coronary artery disease (CAD) mortality rates in the U.S. decreased by 70 % since its peak in 1968, despite a doubling of diabetes and obesity. The current prevalence of obesity is 33% for men and 35% for women. The relative importance of secondary prevention ( in people with heart disease and primary prevention (in people without heart disease) in explaining falls in CAD mortality was analyzed using the IMPACT model carried out in 2008. Approximately 316,100 fewer deaths were attributable to risk factor declines: 64,930 in CAD patients (secondary prevention─21%) and 251,170 in asymptomatic individuals (primary prevention─79%). Smoking declines accounted for approximately 8390 fewer deaths in secondary prevention and for 46,315 fewer deaths in primary prevention. Cholesterol falls gave approximately 22,210 fewer deaths in CAD patients and 107,300 fewer deaths in asymptomatic people (primary prevention). Statins accounted for approximately 16,580 fewer deaths, that is, one sixth of this mortality fall. Systolic blood pressure declines accounted for approximately 34,330 fewer deaths among CAD patients and 97,555 fewer deaths in asymptomatic individuals (primary prevention). Antihypertensive medications accounted for approximately 23,845 fewer deaths. U.S. health officials are teaming up with insurance companies, pharmacies, health providers and community groups in a campaign to prevent 1 million heart attacks and strokes over the next five years. The plan announced on October 2011by the U.S. Department of Health and Human Services and several partners, will focus on reducing risk factors through smoking prevention, blood pressure and cholesterol control, and increased use of low-dose aspirin to prevent blood clots. Health and Human Services (HHS) plans to kick in $200 million in new and redirected funds towards the project, which marks a dramatic shift in disease prevention. “Heart disease causes 1 of every 3 American deaths and constitutes 17 percent of overall national health spending,” HHS Secretary Kathleen Sebelius said in a statement. 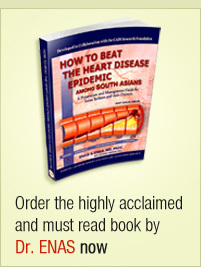 The effort builds on strides in preventing heart disease deaths in the United States, which have fallen by 50 percent between 1980 and 2000.”If we succeed in achieving our Million Hearts goals, 10 million more Americans with high blood pressure will have it under control, 20 million more Americans with high cholesterol will have it under control, and 4 million fewer Americans will smoke by 2017,” CDC Director, Dr. Frieden said in a statement. The program will focus on helping Americans make healthy choices, such as preventing tobacco use and lowering consumption of salt and trans fats, and increasing use of treatments like aspirin and blood pressure and cholesterol-lowering medications. The program aim to cut smoking to 17 percent of Americans from 19 percent by 2017, and seek a 20 percent drop in sodium intake and a 50 percent drop in trans fat consumption. In the private sector, partners like Walgreens will provide free blood pressure testing, insurance companies such as UnitedHealth Group, WellPoint, Aetna and Cigna will focus on reducing heart risks through programs aimed at their members, and pharmacy groups will encourage members to raise awareness with patients. By shifting our focus from paying for how much care is provided to how to get the best health for Americans and putting more tools into the hands of health care providers and patients, Centre for Medicare Services can help prevent strokes, heart attacks and avoidable human sufferings. Q. What are the approaches to achieve the million hearts goal? 1. Xu J, Kochanek K D, Murphy S L. Deaths: Final Data for 2007.National Vital Statistics Statistics Report. Vol 58,. CDC, Atlanta 2010. 2. Young F, Capewell S, Ford ES, Critchley JA. Coronary mortality declines in the U.S. between 1980 and 2000 quantifying the contributions from primary and secondary prevention. Am J Prev Med. Sep 2010;39(3):228-234.